Nothing beats outdoor dining when the weather cooperates. 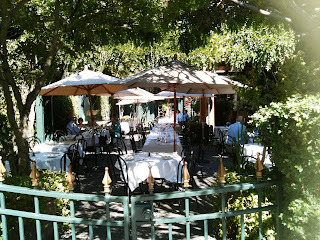 We've been having warm and sunny days lately so when our office staff had the opportunity to eat lunch together, I suggested we go to the Empire Tap Room in Palo Alto where we could sit outdoors in their beautiful patio and enjoy Indian summer temperatures. When you enter the main door of the restaurant, you are immediately confronted by the shiny and well polished bar which extends the length of the dining room. Then your eyes are directed to the patio where vines cover the walls, trees and white umbrellas provide ample shade and the drip drip of water from the fountain complete the relaxed ambiance. It feels like a mini getaway to sit in this patio.